The Halloween Go Go: Crypt-ic Tales, Exploding Pumpkins, Jekyll & Hyde & Disney + More! You spray-painted the styrofoam balls. You glued on the Twizzlers. You stapled pom-poms with abandon. 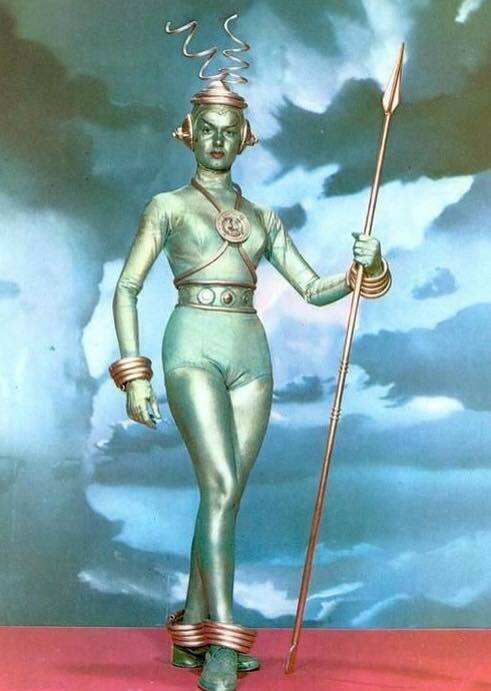 But somehow, your Halloween costume still doesn’t read Old Hollywood Glamour. Let the following distract you from fashion failure…. If the above greeting is familiar, you’ll want to clear your calendar, ready your credit card and start Halloween with a nostalgic bang. Ms. Go Go is talking a date with the Crypt Keeper…if you dare. 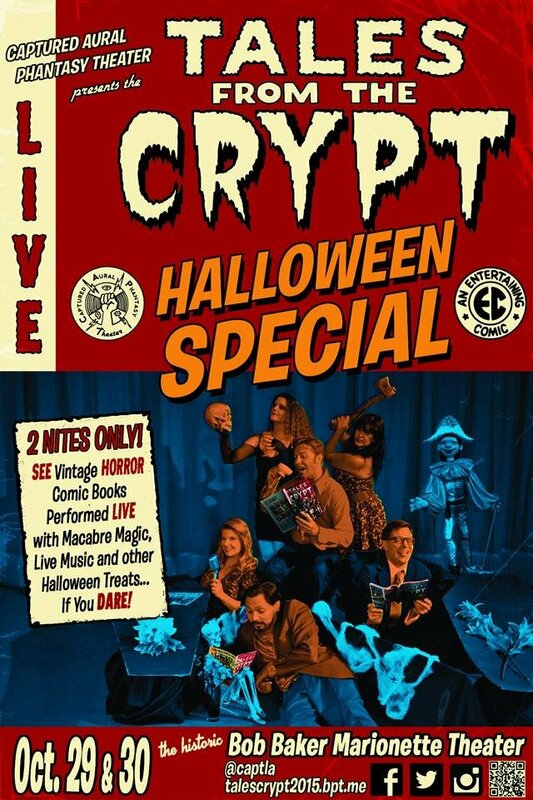 Starting Thursday for a two-night-only run, Captured Aural Phantasy Theater presents Tales from the Crypt: LIVE multi-media performances of classic, 1950’s horror comic books. Captured Aural Phantasy Theater is the only troupe in the world — and probably the parallel spooky universe as well — that is authorized to dramatize the iconic Tales of the Crypt on stage…and the stage just happens to be in the slightly creepy Bob Baker Marionette Theater. Which is fitting since legendary horror goofball “the Crypt Keeper” was a puppet. Expect spooky music, unsettling magic acts and drinks. Speaking of drinks, head to Taix Restaurant pre-show, order a #cryptini, tag @captla and get a treat at the door the night of the show. As if drinks weren’t enough, there will also be candy. At least…we hope it’s candy. You never can tell with the Crypt Keeper…. CAPTURED AURAL PHANTASY THEATER PRESENTS TALES FROM THE CRYPT — Thurs, Oct 29 & Fri, Oct 30; 7:30pm doors/8pm show. $20 presale/$25 door — Bob Baker Marionette Theater, 1345 W 1st St, LA 90026. Tix and more info HERE. Also: The Self-Carving-Exploding-Pumpkin-Laboratory at the Craft and Folk Art Museum. Brought to you by the mad scientist artistes at Machine Project, the autumnal art project-meets-Molotov cocktail kicks off your H’weenie weekend and promises “good clean pre-Halloween family fun” including “gruesome oozing” and “frightful explosions”. In other words, plenty of bang for the yuck. The fee includes materials and a pumpkin. You’ll also learn about chemistry and the history of pumpkin carving. 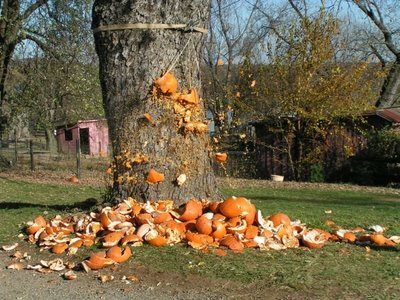 THE SELF-CARVING-EXPLODING-PUMPKIN-LABORATORY — Fri, Oct 30; 7-9pm. $20 GA. $15 Members (Machine Project & CAFAM). 18+/under 18 must be accompanied by an adult — Craft and Folk Art Museum (in Museum Courtyard), 5814 Wilshire Blvd, LA 90036. Tix and info HERE. Dr. Jekyll & Mr Hyde + an organ. See the horror, be the horror. Don your creepiest costume and head to DTLA for the ultimate exploration of the dark night of the soul. Ms. Go Go is not talking back alleys but a monster…organ, that is. 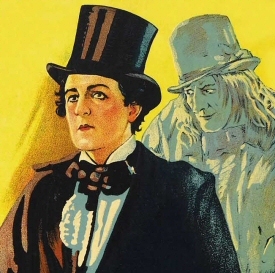 Walt Disney Concert Hall presents Paramount’s classic Dr. Jekyll and Mr. Hyde: the first cinematic adaptation of Robert Louis Stevenson’s exploration of good and evil with John Barrymore playing both sides of the split personality. For instance, don’t obstruct others’ view with an evil, extra head. DR. JEKYLL AND MR. HYDE WITH HALLOWEEN ORGAN — Sat, Oct 31; 8pm. $38 – $68.50 — Walt Disney Concert Hall, 11a South Grand Ave, LA 90012. For tix and more info, incl directions & parking, go HERE. Previous Post The Go Go: Lit Crawl, WestEdge Design, Oyster Fest, Dia de los Muertos + More!